Mercer Union is pleased to present A Purple Haze, an installation of sculptural and photographic works by Vancouver artist Warren Murfitt. 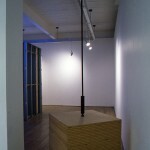 The installation opens with a hanging, laminated plywood cube which partially obstructs the entrance to the gallery. 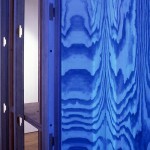 Inside the gallery, a small constructed room contains a floor-to-ceiling photograph of swirling plywood grain bathed in black light. The interior of the room is framed by two curved mirrors. The room’s restricted space the distorted mirror reflections suggest the disquiet of a sideshow house of horrors. A Purple Haze insinuates the viewer into an subtly unsettling body-to-body experience. Murfitt’s work explores the human tendency to both anthropomorphize the natural world and to reflect the body in the built environment. 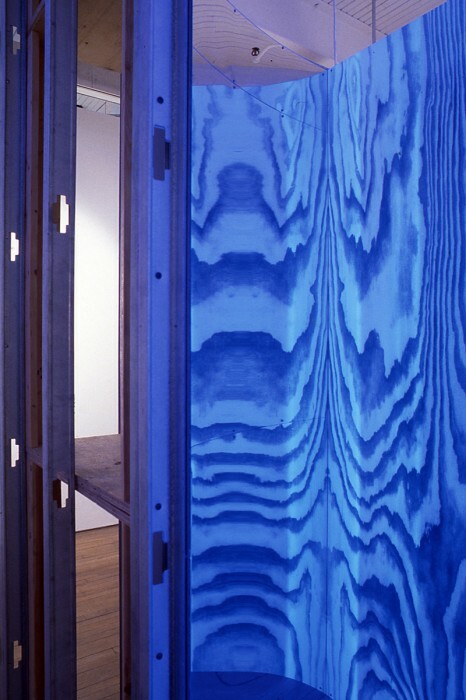 The enlarged photographic image of plywood grain suggests giant fingerprints suspended in an environment of (black light) psychedelic hallucination. His insistent use of fit plywood makes reference the public debate surrounding British Columbia’s precarious resource based economy. Murfitt works plywood and other common building materials as though rigorously adhering to an industrial building code. His deft and careful constructions point to the preeminence of architecture in our experience of objects. 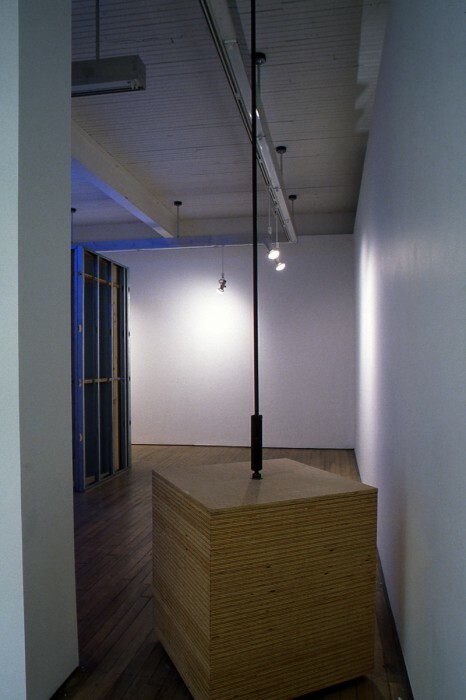 Murfitt is the founding director of (N)on-Commercial Gallery in Vancouver and was the coordinator for Vancouver’s Adverse Practises (Bus Shelter Project) in 1988. He has exhibited extensively in Western Canada, most recently at Gallery Sansair. This is his first Toronto exhibition. A brochure with a text by Reid Shier has been produced in conjunction with this exhibition. When Warren Murfitt exhibited two pieces titled A Purple Hazein Vancouver, their structure and motifs elicited for me memories of the midway at the Calgary Stampede. In the early 70s–the last years of the touring freak shows and their attendant hucksterism–this midway was run by a company called “Great American, and I particularly remember a house of horrors whose facade was decorated with the representations of a number of gruesome dismemberments. Though I was as frightened of going into it as I was of the rusty rides and their intimidating carny hosts, the images were dangerously fascinating. I felt that the person who painted the horror house mural really liked those images, and if given the chance might act them out. However delicious that fear was, I was relieved when, around 1975, “Great American” was replaced by the clean-cut and well oiled “Conklin” company. Their employees all wore uniforms and the mural’s bright gore quickly gave way to pastels and teddy bears. A corporate ethos of denatured, non aberrant, family fun had replaced its dangerous other. Like that disneyfied fairground, the architectural space of the gallery carefully circumscribes the activities within it. The risk of a real confrontation with difference, with the unstable mess of the exterior world, is mediated by the gallery’s pristinely constructed space. 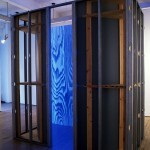 As an artist who earns his living as a carpenter, Murfitt has both built and filled such spaces. The attendant social and economic ironies–the moderately well paid but replaceable “worker” transformed willy-nilly into the impoverished but unique “artist”, the creator of the white cube becoming its fetishized occupier–have not been suppressed in Murfitt’s work in the interests of creating a discrete practice, but have formed its basis. The very polarities that he inhabits–creator and occupier, artist and worker–are predicated upon the permission and sufferance of a third force–the powers that define the nature and function of such spaces. 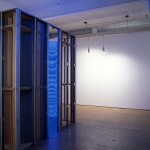 Murfitt deals with this problem by foregrounding the mechanisms and the structures of the architecture itself, and each of the pieces titled A Purple Hazeare built or are conditional on a spatial matrix which frames both the art and the viewer’s relation to it. 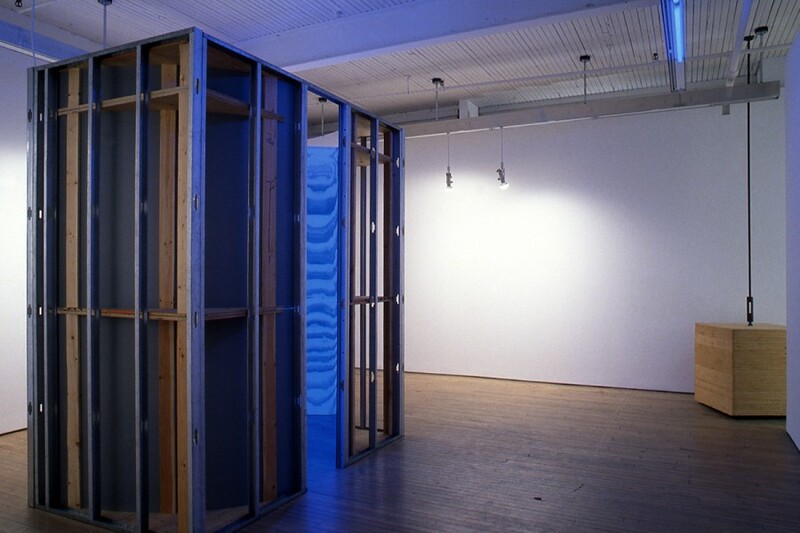 In one, an actual room is constructed so that its framing–the exoskeleton–presents itself to the viewer. A small entrance opens onto a wall covered in a large black and white photograph of fir grained plywood, (its patterning an allusion to abstract expressionist painterly practices as well as their prosaic antithesis in cabinetmaking and the heated local resource debates). 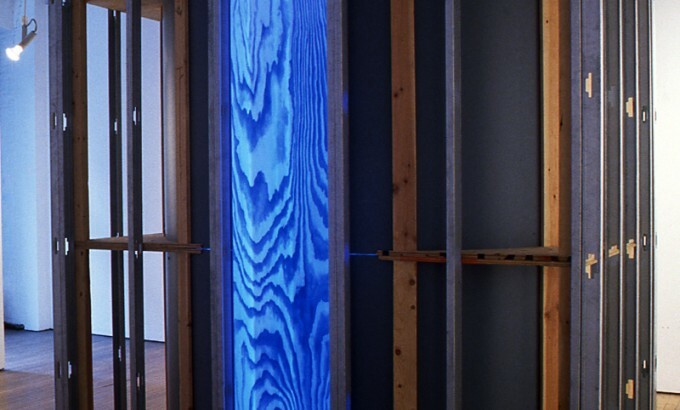 The image is illuminated by black light bulbs which flank the inside of the”door” and which blur and obfuscate the image of the fir grain. This vertiginous experience is complicated by two distorting mirrors which extend out from either side of the entrance and curve to meet the back wall. 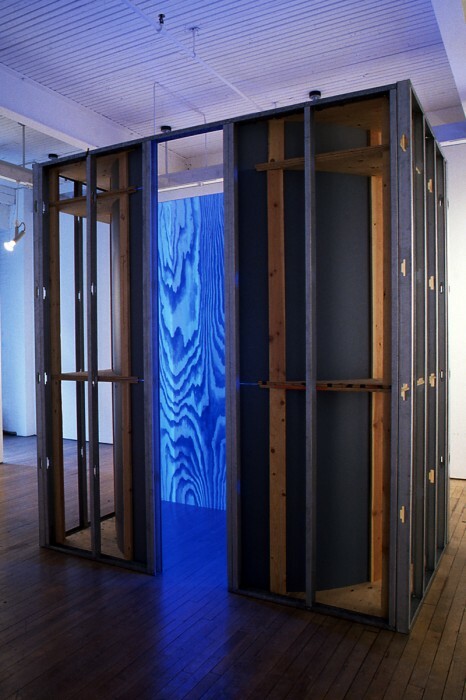 The result is destabilizing, a room erected out of particular industrial materials to a rigorous standard but whose interior is confining, the intention of which is elusive, the experience of which makes the viewer uncomfortably queasy. Perhaps the room is analogous to a body, but one whose constituent parts are determined by a building code, the unyielding rigor of which is never more than a temporary and arbitrary set of rules based on a hierarchical and bureaucratized social consensus. Within this body/house is the squeamish identity of a person, both particular and contingent. A Purple Hazeat the Gallery Sansair, presented the gallery itself–a tiny little six by ten foot closet–as the matrix. Inside Murfitt again hung screen prints of plywood on the back wall, and again they were illuminated by black light. Suspended from the ceiling were four differently sized cubes on swinging hinges, each cube constructed out of what appeared to be stacked sheets of plywood. If this were the actual method of construction, and the industrial joints holding them up appeared to support this, each cube would be extraordinarily heavy. To enter the gallery one had to physically move the first and largest cube, which acted like a turnstile. Moving past, the pendulum force gently nudged the cube back into the viewer. The feeling was curiously slight and because I’d seen their construction I knew this was because the boxes were faux–hollow cubes constructed out of plywood end cuts–shop detritus. They were a little bit dangerous, but not because of what could happen–nothing could happen–but for what they implied. It took just a small nudge with a finger to set them in motion, to upset their implied weight, to render those implications impotent. These two works are almost clumsily anti-mediated, virtual in a way that is crude. My experience of the art “objects”, with the cubes and the cheaply done screen prints was, I believe, intentionally disappointing. What they remind us is that objects within space are structurally meaningless without the defining parameters of an architectural context. It is space that is the effective agent in Murfitt’s pieces, the crack between the wall and the de-weighted Juddean cube through which we are forced to squeeze. It’s the nauseating cramped space in front of the mirror that destabilises, however briefly, our ability to focus. I was terrified of the mural at the Stampede because that context allowed in my mind the possibility of those depicted events. There was no corporate parent to make it safe and to turn out the lights. Murfitt’s pieces remind the viewer of the power of gallery space to codify experience. It’s our bodies that architectural engineering is proscribing and upon which our experience of objects is being inscribed. Murfitt is attempting to show that it is with our bodies, with fear, that we experience difference. In placing within the gallery’s neutral space a carefully calibrated enactment of physical disturbance, Murfitt exposes that neutrality’s plainly fictive nature and the insufficiency of the descriptive systems to which it has given rise.